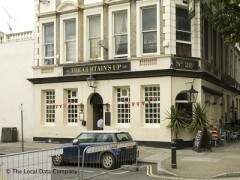 About: Curtains Up is a theatrical theme pub with the Baron's Court Theatre situated beneath it (box office no. (+44 (0) 20 8932 4747). Bar meals are served every day until closing time, and they can cater for private parties of up to 50 people. Pavement seating is also provided. "Good food and drinks at good prices... a great local"
When the English May weather is more akin to that of February, The Curtains Up was the perfect refuge. To be greeted by a warm, buzzy room and friendly decor was exactly what the doctor ordered and were this my local I could see myself spending many a long afternoon here. The name of the venue is derived from the fringe theatre that finds itself in the cellar of the pub and so its not surprising that it would attract a mixture of edgy actors as well as some smarter suits. My wife and I were greeted by a friendly waitress and shown our table. Unfortunately this table later proved to be a little too close to the main door which allowed chilly gusts in every time it was opened but as we were the closest I think we were the only ones to notice. The menu was classic gastropub with a good selection of hearty starters, mains and deserts and all at reasonable prices. Four of the dishes were not available which was slightly disappointing but there was enough left on the menu to keep us happy. I was torn between the Soft boiled hens egg haddock fish finger soldiers (£6.50) and the Potted chicken liver pate and toast (£6.95) and went for the latter. My wife was taken by the Smoked salmon and broccoli tart (£6.50). The pate was delicious and the doorstep toast did the job of transferring generous helpings to my mouth well although I would have liked it slightly more toasted and slightly hotter. The dish came on a salad of rocket and spinach in whole grain mustard dressing. Unfortunately the salad leaves were gritty which completely spoilt the salad. The mustard had actually been applied a little too liberally as well so all in all the greenery was not a very pleasant experience which sadly came back to haunt me in the next course as well. Salad aside it was a perfect winter starter. The tart was a perfect mixture of flavoursome fish, veg and herbs in a creamy egg filling served piping hot. The main courses were classic pub grub with burgers, steak, a smattering of fish and the token vegetarian salad on offer. We were nearly tempted by the sharing dishes of Fish (£10pp) or Shepherd’s (£9.50pp) pie, which couples were enjoying around us, but I went for the Roast Scottish salmon, salad of peas and feves lemon dressing (£10.50) while my dinner date had Chicken Kiev, hand cut chips and house salad (£10.75). Let's get the salad out of the way first. Both of us had an encore of grit (purely down to being poorly washed I am told) in the salad so I really didn't bother with mine much. I did manage to rescue a few of the peas and beans and they were fine but the heavy handed mustard dressing didn't add much positive news to the equation. My salmon was very tasty and cooked perfectly. It did get cold a little too quickly as my plate was not really hot. I fail to understand how any eating establishment these days doesn't serve food on hot plates but there we go. Instead of chips I thought I would go healthy and ordered a side portion of corn on the cob (£3). This is not something I often see on menus but we should see more of it. It was perfectly cooked and very pleasing indeed. My mouthful of the chicken Kiev was good but a little lacking in Kiev. We did eventually find a pocket of garlicy, buttery goodness but it wasn't until most of the otherwise tasty and moist chicken had been eaten. The hand cut chips were delicious but the dish as a whole was punching above its weight in the over £10 bracket. The deserts were all delicious sounding but by this stage my hunger had been pretty much quenched so we decided to share a Tart tatin and ice cream (£5). If I am honest I am not sure I would have recognised it for what it was had I not known, as the apples really hadn't been caramelised at all so that they still tasted a little tangy and not as good as I think they should have done. The pastry was more like what I was expecting and was good and the ice cream was delicious. The wine list did exactly what a gastropub wine list should in my view and covered all of the main bases at very reasonable prices (we weren't in a champagne mood but £50 for Pol Roger is cracking value) and the most expensive bottle of wine was £25. Most wines were available by the glass (large or small) and we were very happy with our choices. The service, although clearly extremely busy, was very good and we felt a little sorry for the friendly, foreign waitress as she rushed around the room. We didn't have to wait longer than normal for anything at all and when we were told at the end of the meal that they were two staff members down that night it explained why the staff were so busy but was also a comment on how well the two who were there had done. The bar which adjoins the restaurant was busy and looked to have a good choice of beers with mellow lounge music that did not disturb our meal at all. Business was brisk on this Tuesday night, with pint drinkers licking pudding spoons,and it looked like a fun place to meet friends. All in all we had a very pleasant evening. This review may sound overly critical of the food, but although The Curtains Up is not necessarily somewhere I would travel across London to eat at, that’s not what it is supposed to be. It serves good food and drinks at good prices and offers the people of Barons Court a great local. We’ll be back.